The Kennel Fairy Sunrise is very young. It was found on the 2006' Year spring. Our first golden is much older - 6 years. Bella was born on the 19th May 2003 and she came to us in the same year end of July. Our first golden is Fairytale's Arabella (Ch. W. Ritzilyn Blues Brother x Ch. Tyrnikarin Ranta Taru), Bella. With the puppy came joy and excitement. Of course first were pissed and shited rugs. Now where the last things and excitement over, but joy and contiment are still there. Our first litter was born on the 19th May 2006. The mother was our Bella (Fairytale's Arabella) and father English male Uno (Hollygold Aprilstorm), who lives in Finland. 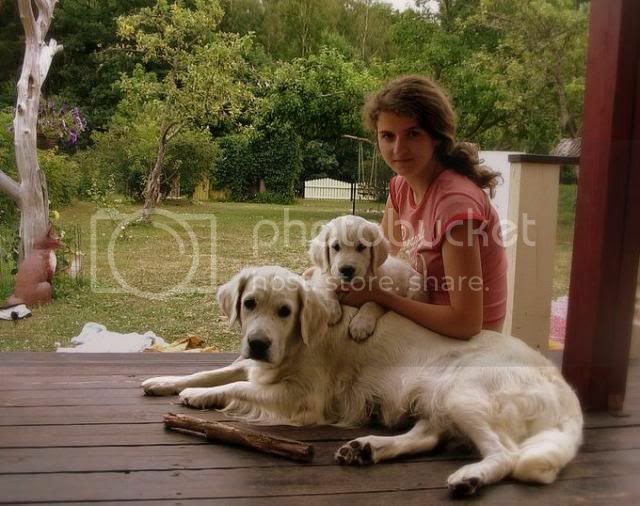 From that litter we kept one female puppy, Fairy Sunrise Bethina, Betty.